For You Blazers: FAC DAY!!!! I had a camp about 2 weeks ago. We had to stayed overnight at the farm and party. We meet up in front of the school. 5 vechicles in total driving toward the farm. This is the entrance to the farm. Very nice area, nice day as well. Nice lake.... This was where the activities start. This was during the lunch time. Queuing up to get my lunch! But when I got to the front of the line, the year 5 ppl gathering the year 1 for mass massacre. This is the molasses pit... GROSS!!! This is the end product of me being thrown into the pit. Molesses - a sugar by product that they feed the horses. Sticky and thick!!!! After I got thrown in I got angry and started throwing ppl in as well. 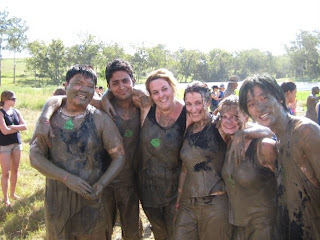 After the molesses pit, we tried throwing ppl into the mud. Was really quite gross but was fun. 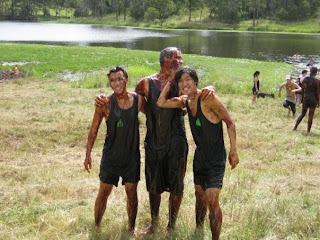 Started throwing mud to each other and ended up very dirty! They started playing against the year, by sending 3 gals and 1 guy. Gals have balloon on them and guy has bull p*nis hanging on them. They are supposed to pop the balloons on the gals. I sprayed my hair green for $5. It was a leukemia project, where ppl voluteered to shave their hair. 1 lady + 2 guys shaved on the spot. We cleaned up ourselves in the lake. This is where the party was held! IN THE BARN! Each year has to send someone up. A guy dresses up as a lady! 4rd year - 2 farm girls! 5th year - a team of cheerleaders.... oh yeah!